Artists from around the world, and around the corner, find their sound at Asheville’s Echo Mountain Recording. Steve Wilmans bailed on Los Angeles, California, nine years ago and bolted to Asheville. Then in his early 30s, the successful sound engineer deemed the mountain town the prime place for his next venture: the recording studio of his dreams. “Asheville got me under its spell,” says Wilmans, now 44. “The whole vibe of the town drew me here. It’s unique, artistic, funky, tolerant, and friendly.” Soft-spoken and slightly scruffy, Wilmans offers little hint that, in its few short years, Echo Mountain Recording has put Asheville on the music-industry map. 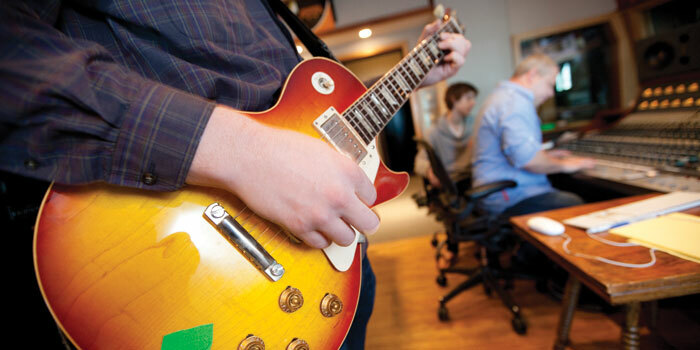 The studio now attracts some of the biggest names in the music business. At the same time, it propels local and regional acts, such as The Avett Brothers, Band of Horses, and Steve Martin and the Steep Canyon Rangers, to new heights. When Wilmans first arrived, the vibe felt right, but he wasn’t sure where to locate. The former warehouses in the city’s River Arts District seemed a natural choice, but nothing quite connected. Then, a former Methodist church, built downtown in the 1920s off Patton Avenue, came on the market. On a sunny afternoon in October 2003, a real estate agent escorted Wilmans through the church’s side door, down a small foyer, and into the high-ceilinged, A-frame sanctuary. The congregation had moved on, but the trappings of worship — pews, hymnals, and pulpit — were still there. A stained-glass depiction of Jesus “suffering the little children” filled much of the room’s back wall. Wilmans bought the building and rechristened it Echo Mountain Recording. Builders, electricians, and engineers converted it into a state-of-the-art studio while carefully protecting much of the church’s aesthetics. In the basement, add-ons included a kitchen and a lounge complete with pinball machines, video games, and couches. It takes a lot, a lot of the time. “We’re a 12-hour-a-day business, six days a week,” Tomasin says. “It’s an around-the-clock sort of thing.” She books all the sessions, conducts continuous customer service, and serves as a one-stop shop for troubleshooting. Echo Mountain continues to expand its offerings. In 2006, Wilmans bought a neighboring building — a former dance school that originally housed the local Salvation Army — and built in several more studios, mixing rooms, and lounges. He outfitted one of the bathrooms with a shower — equipped with cables connecting to a studio, should anyone want to record a singing-in-the-shower sequence. Between the two downtown buildings, Echo has 15,000 feet of production space. A half-dozen different projects may be underway at one time. One day earlier this year, in the “church” studio, Grammy-nominated country star Dierks Bentley was recording his new album and sharing the process with his fans via a live webcam; next door, two lesser-known, local acts — hip-hop artist Cactus and folk-rocker Josh Phillips — were putting the finishing touches on their latest tunes. Meanwhile, Ben Lovett, a film-score producer and up-and-coming indie music artist who recently moved to Asheville, was working on a video shoot for a single off his new album. Despite its youth, Echo Mountain already plays a major role in bolstering the area’s musical offerings, says Martin Anderson, a DJ and the music director for Spindale-based WNCW, which highlights local music, including many tracks laid down at Echo Mountain. For every big-name band visiting Asheville to make music at Echo Mountain Recording, there’s a lesser-known, local act entering the studio hoping to make something big happen. When Black Mountain-based singer/songwriter Kellin Watson recorded her latest album, she teamed up with top musicians based in New York and Connecticut. While that partnership required her to record up North, she insisted on coming back to Echo Mountain for three of the 14 tracks. She first recorded at the Asheville studio in 2004, just after it opened. “From the very beginning, I was hooked on Echo,” she says. Watson, who has a local and regional following with her sultry and soulful tunes, stays true to her musical form on Halo of Blue, her fourth and most accomplished album, which is slated for release this summer. As a testament to her fan support, Watson raised the money for her new album through a website where fans pledged money. On the new album’s title track, Watson’s band recorded lilting pedal steel guitar parts in one of the studio’s smaller rooms; the guitar offers a delicate complement to Watson’s forceful vocals. The two songs recorded in the “church” studio — the gospel-tinged “Rise” and a smoky, brooding cover of “Sitting on Top of the World” — showcase Watson’s range and confidence. She sounds every bit the singer in her comfort zone, content with recording close to home. Halo of Blue by Kellin Watson. Michael Bellar, Producer. 2011, 14 tracks, $15. Jon Elliston is a freelance writer who lives in Asheville. He is the coauthor, with Kent Priestley, of North Carolina Curiosities.